It doesn't feel like fall until we are picking apples and pumpkins at our favorite local farm and finishing off the day's activities with an apple cider donut. This vegan version, adapted from a recipe from My Darling Vegan, is surprisingly light in texture yet full of richness, thanks to cinnamon, nutmeg, maple syrup, and, of course, spiced apple cider. It's a relatively simple recipe that showcases the flavors of fall, and in case you want to doll up your donut, we've included instructions for a cinnamon sugar coat as well as for an apple cider glaze. While both are delicious and encouraged, the bare version is totally pleasing too. Make these throughout the fall (perhaps with some pumpkin spice tea lattes and some vegan and gluten-free pumpkin donuts). They are perfect for Halloween parties, and they smell as heavenly as they taste! Happy fall! 2. Mix the dry ingredients. Preheat the oven to 350F. 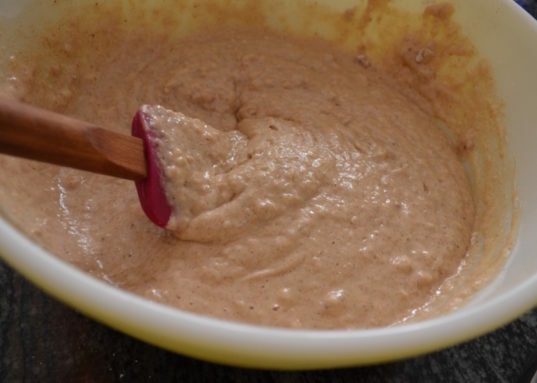 In a large bowl, mix together the flour, cinnamon, nutmeg, baking powder, baking soda, and salt. 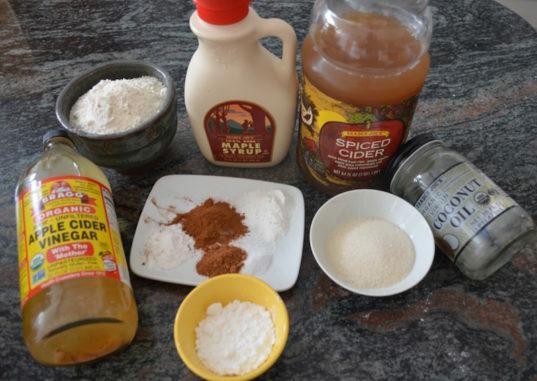 In a medium bowl, mix together the maple syrup, applesauce, apple cider, coconut oil, vanilla extract, and apple cider vinegar. Whisk to incorporate the ingredients fully. Mix the wet ingredients into the dry, stirring until there are no lumps. You don’t want to overmix, however; it will make the donuts gummy. 5. Spoon into the donut molds and bake. 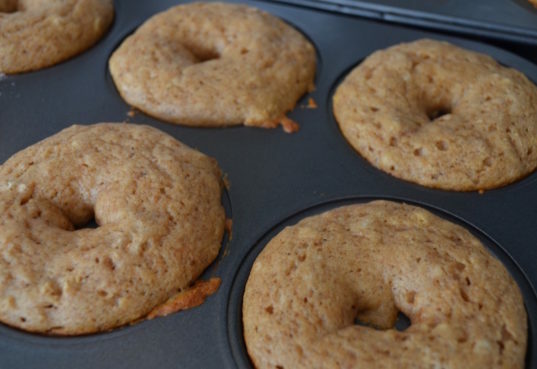 Using a bit of parchment paper or plastic wrap, add a few drops of coconut oil to the donut molds and spread the coconut oil around to keep the donuts from sticking. Spoon around 2 1/2 tablespoons of the batter into each donut mold (or until donut mold is nearly full). Bake for about 9-10 minutes, then remove the donuts from the oven and let cool for about 5 minutes. After 5 minutes, you can release them from the molds and let cool more on a rack. 6. Make the cinnamon sugar and glaze, if using. While the donuts are baking or cooling, make the cinnamon sugar. In a small bowl, mix the granulated sugar and the cinnamon together until they are combined and fragrant. For the glaze, in another small bowl, add the confectioner’s sugar and cinnamon. Slowly add the apple cider a teaspoon or so at a time and whisk until you have the desired glaze consistency. You can always add more confectioner’s sugar if the glaze becomes too runny. 7. 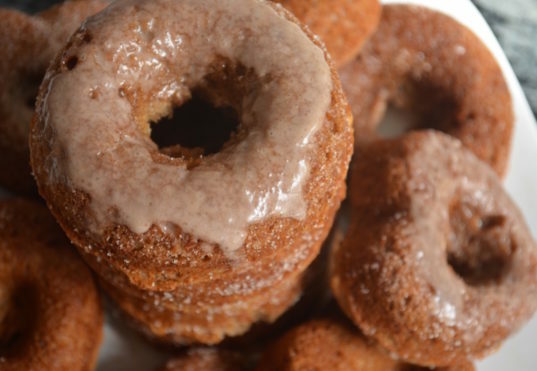 Toss the donuts in cinnamon sugar and top with glaze. 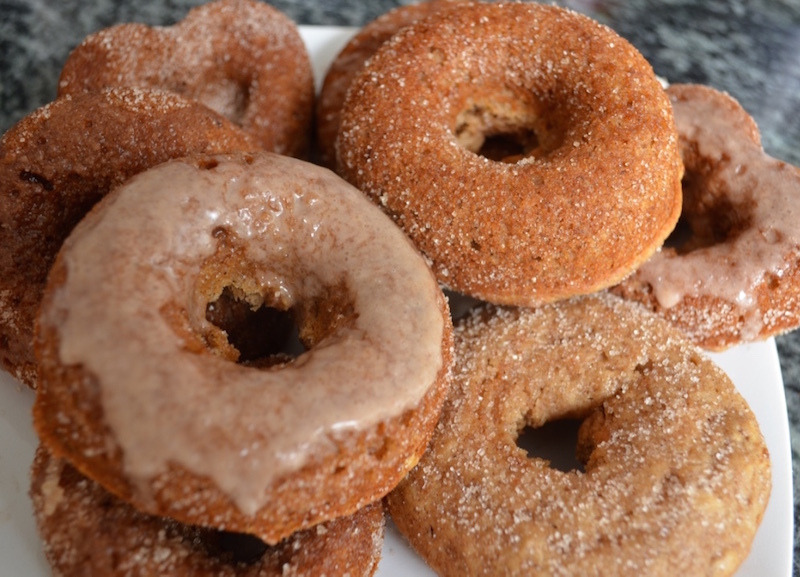 Once the donuts have cooled, toss them in the cinnamon sugar. I like to add a few tablespoons of cinnamon sugar to a separate bowl and then toss each donut individually, sprinkling more cinnamon sugar over the donut to make sure it gets coated completely. If using the glaze, you can dribble or spread the glaze over the donut. Once these donuts have been tossed and glazed, serve immediately. 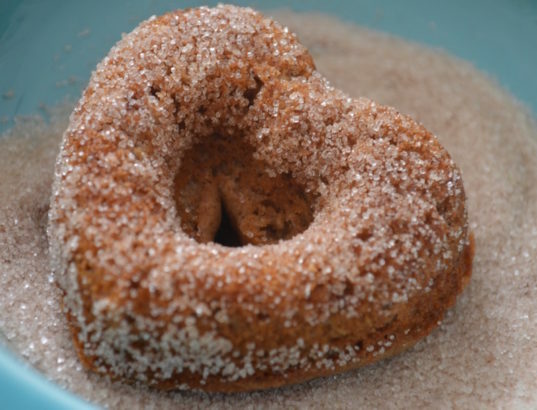 Because this is a moist donut, it will absorb the cinnamon sugar and glaze over time, so if you are waiting a few hours or even a day to serve them, I recommend tossing them with sugar and glazing them just before serving. These donuts taste best right after being cooked (just like at a fall festival), but you can store them for up to two days at room temperature in an airtight container. Recipe makes 12 donuts. Happy fall donut eating! This recipe was adapted from My Darling Vegan. If you enjoy the recipe, follow My Darling Vegan for more great vegan recipes. Preheat the oven to 350 degrees F. In a large bowl, mix together the flour, cinnamon, nutmeg, baking powder, baking soda, and salt. 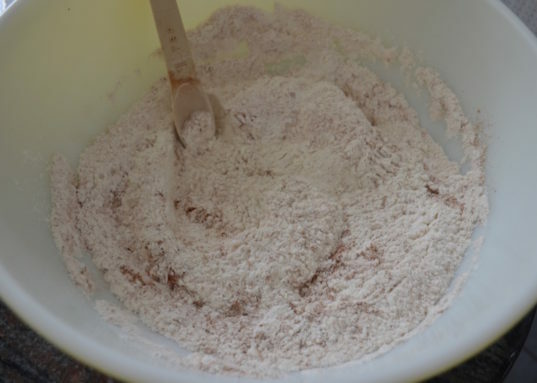 Mix the wet ingredients into the dry, stirring until there are no lumps. You don't want to overmix, however; it will make the donuts gummy. While the donuts are baking or cooling, make the cinnamon sugar. 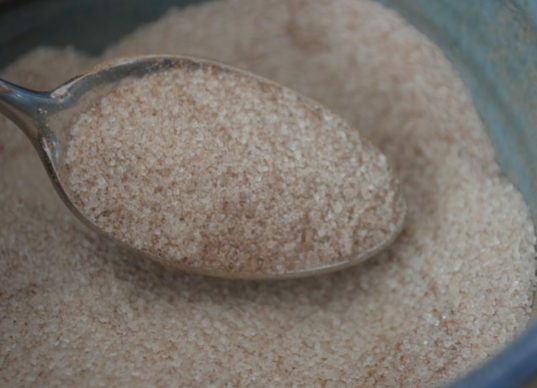 In a small bowl, mix the granulated sugar and the cinnamon together until they are combined and fragrant. For the glaze, in another small bowl, add the confectioner's sugar and cinnamon. 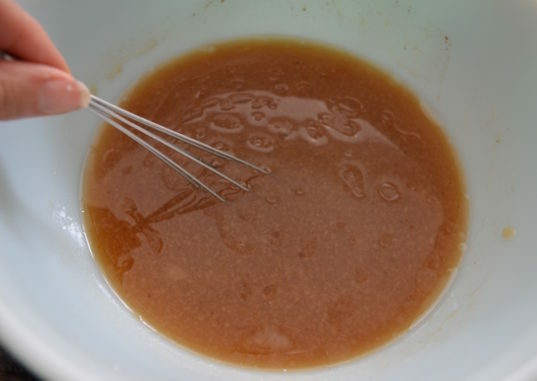 Slowly add the apple cider a teaspoon or so at a time and whisk until you have the desired glaze consistency. You can always add more confectioner's sugar if the glaze becomes too runny. Bite into a donut and enjoy the taste of fall! These donuts are sure to be a crowd pleaser.